Microgrids are difficult to implement and can be undermined by promises of grid expansion. Nuclear power was supposed to be, “Too cheap to meter.” The infamous Segway was supposed to transform the way our cities function. Sometimes technologies don’t take off the way we think they will. And, it’s as important to learn from the failures as it is to extrapolate from the successes. Microgrids are viewed by many as a transformative solution for the future. In the developing world, the technology has the potential to bring a clean, small-scale, self-contained electricity supply to remote areas where a connection to the centralized grid would be relatively expensive. Governments, private foundations, and international aid organizations have launched ambitious microgrid initiatives to enable rural electrification and promote economic development. By 2030, the International Energy Agency is projecting that microgrid systems will supply almost half of newly connected households. Our recent experience with a solar microgrid provider in India has fallen short of these expectations. And, we think there are some important lessons in our project’s fizzle. As we explain in our new working paper, we set out to evaluate the real-world performance of a promising solar microgrid technology in remote areas of India where conventional grid power is very expensive to supply. We partnered with a startup, Gram Power, founded by a UC Berkeley grad, Yash Khaitan. Gram Power’s original goal was to allow unelectrified, rural communities to transition from no power to a smart grid system that integrates off-the-shelf solar panels, modular battery storage, inverters, and a pre-payment model. 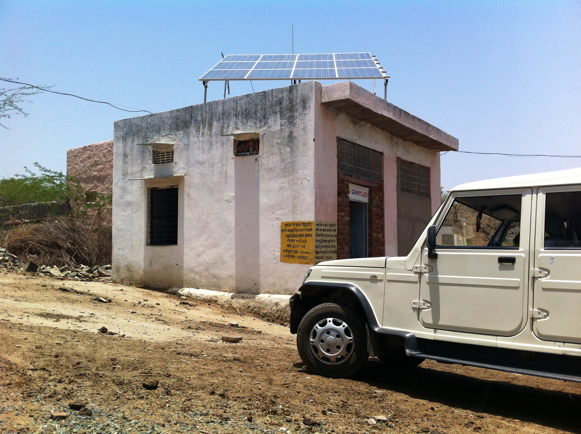 We received grant funding to deploy about 40 Gram Power microgrids in rural Rajasthan, India. At the time, the government was subsidizing private sector microgrid providers as part of a large-scale effort to extend electricity access to all. Gram Power planned to charge its customers just enough to cover its after-subsidy costs: A one-time 1,000 INR (~$20) connection fee, a per kWh charge of 20 INR per kWh ($0.40/kWh), and 150 INR per month fixed charge ($3). If all households paid for the power they consumed, and if the solar PV systems operated reasonably efficiently (~13% capacity factor given the local operating conditions), the company projected cost recovery in about 6 years. In terms of reliability, households were promised 24/7 power as long as they limited their consumption to basic services, such as cell phone charging and lighting (customers were given a CFL bulb as part of the connection package). Customers could add higher wattage appliances, like refrigerators and fans, but continuous supply for higher wattage appliances wasn’t guaranteed. The first challenge arose when Gram Power went looking for customers. The company did research to identify villages that were unlikely to gain conventional grid access in the foreseeable future. They visited 176 of these unelectrified villages to actively market their microgrids. In the end, the company was only able to deploy microgrids in 10 villages. So, what was the problem? Many villagers were holding out for “real” electricity. In some cases, local politicians had made election promises that a connection to the centralized grid was imminent. Legitimately, the Government of India has made truly impressive strides towards its promise to provide electricity access for all. Although the fine print of this pledge leaves many households in the dark, the promise of relatively cheap conventional grid power was enough to dissuade many potential microgrid customers. Households also balked at the price of the Gram Power system. Recall that the Gram Power connection fee was approximately $20. To put this in perspective, the average income among households in the villages that adopted microgrids was around $110 per month. Also, the subsidized per kWh charge for grid power for poor rural customers is less than 5 INR. To cover expected costs, Gram Power’s per kWh charge was four times as high! In sum, it proved very hard—and expensive—to compete with the promise of subsidized grid power. Power theft is a problem in India, and Gram Power correctly anticipated this challenge. Yash and his colleagues developed smart metering technology to detect theft using a sophisticated, but impressively cheap, mesh network technology. What we learned the hard way, however, is that smart theft detection is not enough. Gram Power’s technology can detect when a meter is being tampered with and identify where on the microgrid the problem is occurring. Power supply to this area is automatically shut off in response. But, if you’re in the business of selling power, you don’t want to punish a thief forever. Negotiating this interaction requires a local agent who can exercise discretion and turn the power back on when the theft problem has been addressed. Gram Power hired and trained local entrepreneurs to not only maintain the system, but also crack down on theft. However, when it came time to report theft or enforce penalties, these individuals were very reluctant. Delegating this unsavory task to community members is complicated by the fact that local entrepreneurs typically have strong personal relationships with the very people they are being asked to monitor and penalize. During our field visits, entrepreneurs acknowledged that theft was happening, but refused to provide names or document the behavior formally. The upshot is that this principal-agent problem, as economists call it, proved to be an important vulnerability for these smart microgrid systems. Even the smartest microgrid technologies can fail if the incentives of the agents who manage them are not well aligned with system success. Some of the problems we faced could be addressed with better policy. For example, to manage households’ expectations about receiving conventional grid access, some countries have explicitly announced plans to connect certain areas with microgrids. On the other hand, these kinds of pre-commitments can limit the ability of governments to respond to changes in relative costs or evolving policy priorities. Even with policy changes to increase demand for microgrids, important challenges remain. Private microgrid providers have to cover their costs, so competing with state-run utilities – many of which are both losing money and cross-subsidizing poor, rural customers – is a challenge. It’s possible that future innovations in microgrid deployments could overcome some of these challenges. Given the problems it encountered, however, Gram Power has suspended microgrid operations and is now concentrating on selling its smart meters to centralized grid operators. With hundreds of millions of grid customers that the Indian government aims to convert to smart meters and the government’s recent pledge to include smart meters for all new on-grid electricity connections, Gram Power’s potential market is huge and growing quickly. 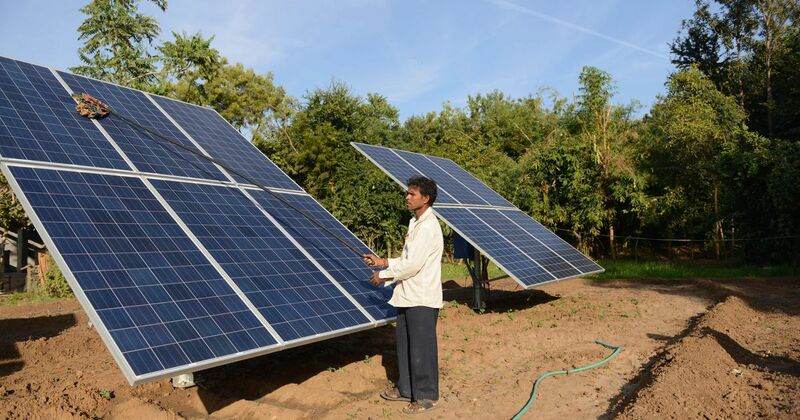 Meanwhile, the Indian government seems to be rethinking its rural electrification strategy, moving away from microgrids and towards providing rural customers with electricity access via solar home systems. Future success will depend on getting both the technology – and the incentives – right. Next Next post: 100% of What? Very nice blog, Meredith. Micro grid power not being perceived as “real” electricity is an attitude frequently encountered among government officials, not just potential customers. Micro grids also have a checkered history of management, though that is improving in some places as businesses supplant community groups and NGOs as operators. However, the big challenge is the one you encountered: the expectation people have to receive highly subsidized power from grid, once it arrives. This leads to resistance to paying anything close to cost-recovering prices for micro grid service, even if benefits of having micro grid service warrant the cost, unless people can be convinced that the grid is not coming for a long time — and what politician wants to state that? Hard as it is to do, dialing down grid electricity subsidies seems to be the only reliable way to deal with this barrier — not to mention being critical for ameliorating the corrosive effects of chronic revenue shortfalls for public sector power distributors. I think your point is generally valid, but costs of a neighborhood scale system with inexpensive wiring is likely to be less than a system for a single house per household. And if each house has solar panels, they might share a storage system and increase reliability and resilience by being locally interconnected. A recent NREL analysis estimated the cost of connecting customers to a mini-grid at $300/customer. That seems to be on the low end of estimates, with some connections in Kenya estimated to average >$1000/customer. Both are higher than the cost of a small SHS. However, it is entirely possible that if a number of houses were very close together, it might be cheaper to link them with one set of solar panels and batteries than to provide each with a solar home system. There are a number of factors that would affect that calculation. “Cheap” wiring, for example, exhibits high power losses if you trying to supply 12V DC power, and may only be viable if you’re providing 220V A/C. That, in turn, requires an inverter at the microgrid, with its attendant cost and efficiency losses. Furthermore, customers needing 220V A/C would typically be ones with refrigerators, power tools, and other energy intensive appliances using significant amounts of power. It seems more likely that this would work for light industrial, commercial, and wealthier household loads, than for bottom of the pyramid households. Isn’t refrigeration the point of adding these systems? That’s the single biggest public health gain of electrification. Thanks for the comment. Yes, refrigeration represents a big step up in demand and cost, and how that technology evolves could have a big impact on the use of SHS’s versus minigrids. Currently, however, refrigeration is pretty much out of reach for customers of either a SHS or a mini-grid. A small A/C refrigerator costs about $300 (in Addis) and consumes 20-30 kWh/month. On the other hand, highly efficient DC refrigerators may consume less than 10 kWh/month, but typically cost over $1000. A colleague and I are currently working on a proposal for a prize competition for breakthrough technology for affordable off-grid refrigeration. Interesting space. Interesting piece. I am increasingly convinced that microgrids will play a much smaller role than SHS’s in providing electricity to those without it. In addition to the regulatory and commercial barriers they face, it is difficult for a microgrid to actually deliver cheaper power to the customer. This is particularly true for solar PV, which offers no significant economy of scale once you’re past the size of one large panel (maybe 200 Wp). It is also true for diesel/hybrid minigrids due to the cost of connection. As noted in an earlier paper cited in this space, new grid-connected customers in Kenya are buying only 20-30 kWh/month. At those levels of consumption, the cost of a solar home system is cheaper than the cost of stringing wire to a household, whether from a microgrid or grid. The principal advantage of mini-grids over SHS’s has been financial: the premise that customers could pay for power as it was delivered rather than incur the upfront cost of their own system. That advantage is also being eroded by pay-go systems employing mobile banking. If the per kWh charge for grid power for poor rural customers is less than 5 INR is subsidized, does anyone know by how much? Politicians love to promise subsidized stuff, and cheap, rural electrification is high on the list. Gram Power is REAL enough; it’s just not subsidized enough to overcome the free-riding incentives facing the rural poor. If governments would switch to more cost-effective poverty alleviation strategies (e.g. contingent cash transfers), they would not interfere so much with market solutions. The difference with a Segway (which was invented by Dean Kamen who started the high school robotics program that I mentor in) is that a plurality of homes in many communities in the US didn’t own Segways. Instead we already have a lot of experience with the core of a microgrid–the solar panels–and the ability to avoid escalating connection costs is real. “Too cheap to meter” comes from Lewis Strauss, speaking for himself, although he was head of AEC. He had not gone to college, and was not as immersed in the details as one would hope for someone who was a spokesman. He did not speak for anyone else, notably, those who knew what they were talking about. There is disagreement as to whether he was discussing fission or fusion. Please do not blame this comment on anyone knowledgeable; likewise, don’t blame the 100% renewables by a week from Thursday claims on those in the field. Energy Institute Blog Are Solar Microgrids the Future in the Developing World?